Existing infrastructure related to the tarsands gigaproject as of 2005. 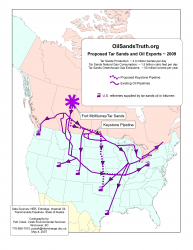 Proposed and existing infrastructure related to the tarsands gigaproject currently set to exist as of 2009. 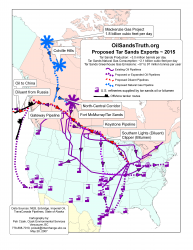 Proposed and existing infrastructure related to the tarsands gigaproject currently set to exist as of 2015. 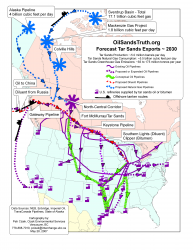 Proposed, existing and conceived infrastructure related to the tarsands gigaproject set to exist as of 2030.